ed investor exposed. The risk being that they will not include winning stocks and their resulting return expectation is negative. ed individuals maximize their expected utility in each period by choosing the stock that is predicted to yield the highest return (highest positive skew). This choice is driven by market capitalization of the portfolio and modeled parametrically using the conditional logit model. ffect vanishes once the top performing stocks in an industry are removed from the sample. ficantly better predictive ability for portfolio return performance in the months following a positive return in an industry than in the months following a negative industry return. fic size portfolios. In particular, we propose an alternative size portfolio that we denominate as the winner-weighted index, based on the forecast rank probabilities of stocks provided by the conditional logit model. 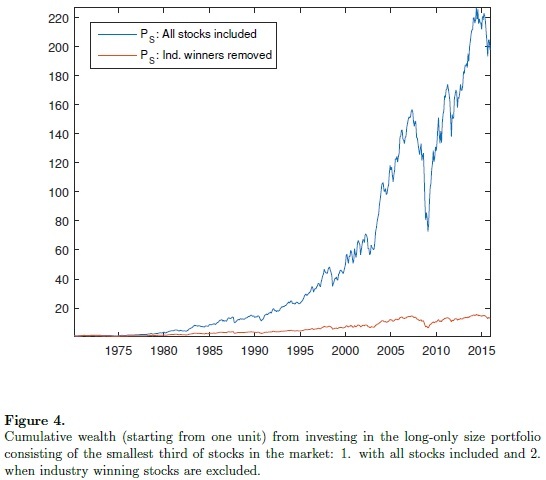 Intuitively, those stocks that are predicted to be winners in the next period receive a larger allocation of wealth than those stocks that have a low probability of becoming winners. More formally, the allocation of wealth to each asset in the portfolio is determined by the forecast winning probabilities obtained from the conditional logit model and driven by asset size. The performance of this portfolio is compared against a cap-weighted index benchmark portfolio. The weights in the latter portfolio are also driven by market capitalization, however, in contrast to our winner-weighted index portfolio, smaller stocks within an industry receive a smaller allocation of wealth. We consider statistical and economic measures such as the Sharpe ratio, Sortino ratio, the certainty equivalent return of a mean-variance investor and portfolio turnover. We observe the existence of two regimes in portfolio performance. During positive industry momentum periods, the winner-weighted index outperforms the cap-weighted portfolio for 19 out of 20 industries, the exception being the utilities industry. This result is, however, reversed in periods of negative industry momentum for which the cap-weighted index outperforms the winner-weighted index in 18 out of 20 industries. ffecting the risk premium rather than the covariance of portfolios with the risk factor."